To what extent was privatisation a clear policy commitment within the Thatcher Governments of the 1980s - or did Government simply stumble on the idea? Why were particular public corporations sold early in the 1980s and other sales delayed until well into the 1990s? 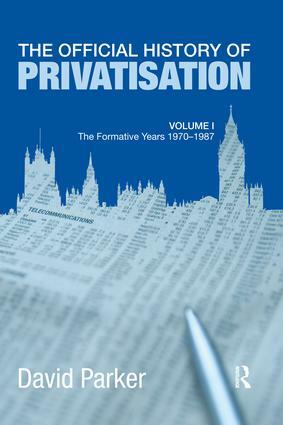 What were the privatisation objectives and how did they change over time, if at all? How was each privatisation planned and executed, how were different City advisers appointed and remunerated, what precise roles did they play? How was each privatisation administered; in what ways did the methods evolve and change and why? How were sale prices determined? Which government departments took the lead role; what was the input of the Treasury and Bank of England; and what was the relationship between Ministers and civil servants? The study draws heavily from the official records of the British Government to which the author was given full access and from interviews with leading figures involved in each of the privatisations – including ex-Ministers, civil servants, business and City figures, as well as academics that have studied the subject. This new official history will be of much interest to students of British political history, economics and business studies.